4 simple easy salad recipes! Gluten free and delicious! 4 simple easy salad recipes | Gluten free and freaking yum. We just added these 4 easy salad recipes to the Get Merry app! Yay, if you have it just check out the snacks and salads section, they’ll be there! And yay it’s spring now, and then summer (woohooo) so this means more BBQs and massive salads. 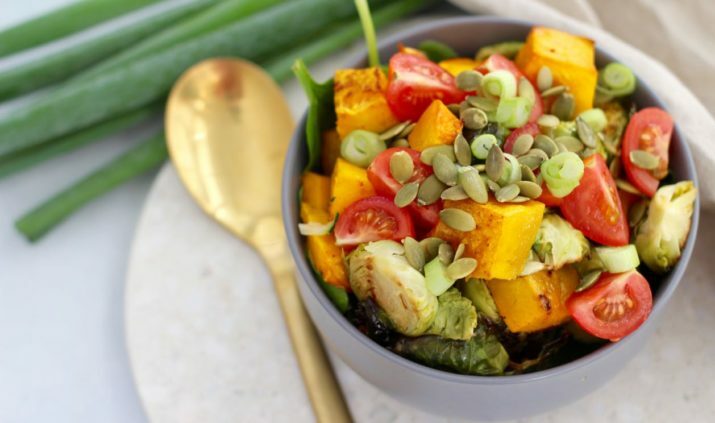 If you’re bored of your go-to salad, check out 4 easy salad recipes! They’re only available on the Get Merry recipe app. And when you download it you’ll get access to over 200 recipes, including special app only recipes (like these ones) plus you can unlock even more recipes from the bundle section. Download your app today! It’s available on both Android and iPhone! This salad is everything! So simple but seriously satisfying! 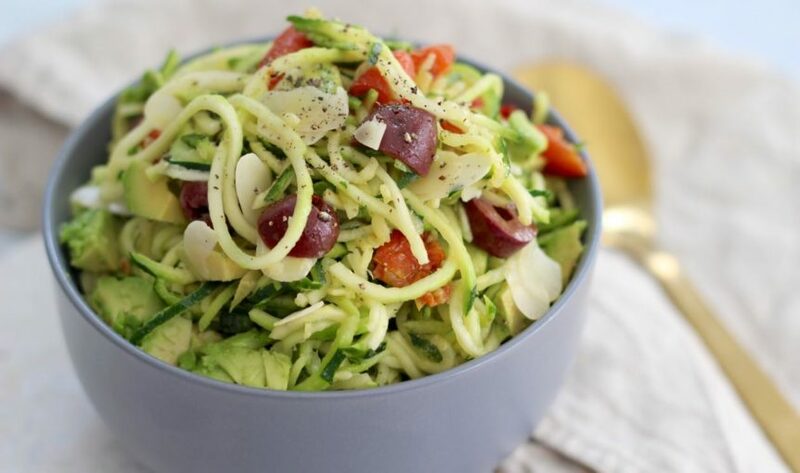 Zucchini noodles, sundried tomatoes, olives and almonds make for one delish as salad! It will take you about 10 minutes to whip up! Ohhh. This has got to be one of our current fave salads. 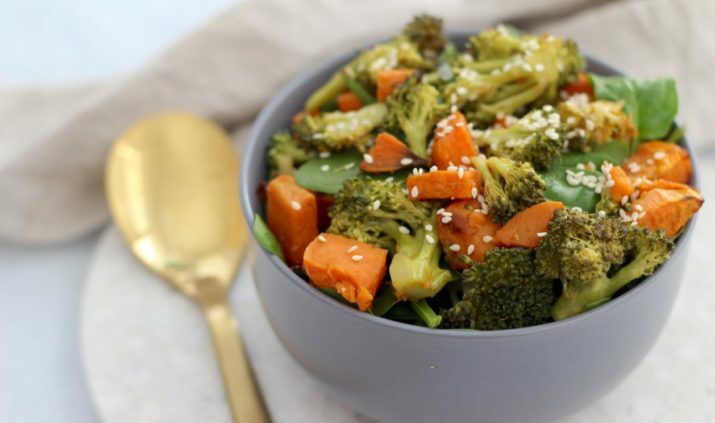 Sweet potato, broccoli, sesame and coconut aminos. Yessss. Yum! Brussel sprouts get a bad wrap but they’re so freaking yum! We promise this salad will surprise and delight you. 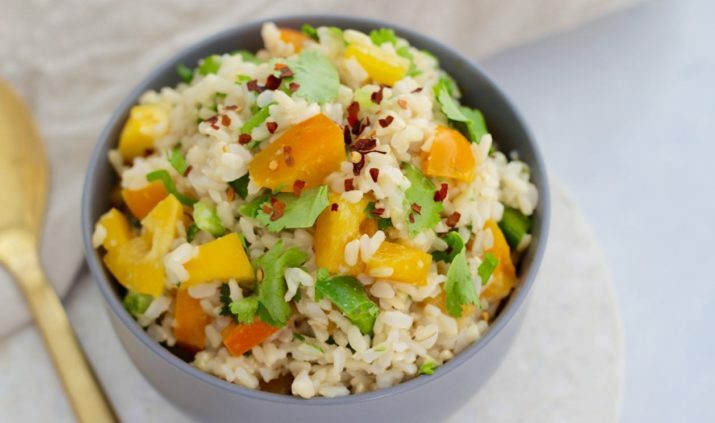 So we made this salad with real rice but you can totally swap to cauli rice if you are 100% grain free. Both equally as yum. Whenever we’re catering for friends and family this one always gets the most comments! Find all these epic easy salad recipes on our app! Learn more over here! Plus you’ll get access to other App only recipes like the peanut butter baked cheesecake, the sweet potato and bacon balls, the loaded sweet potato chips, the date free bliss balls and more!